On my most recent trip to Taiwan, I bought the Hunger Games series on my Kindle, and I had such a great time reading them! 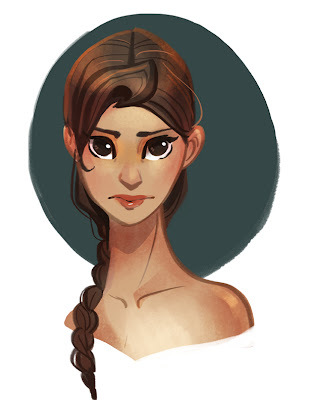 I'm very excited for the films, but I wanted to do a sketch of what Katniss looked like in my head. I imagine her with large Doe like eyes, but a narrow sharp jaw and strong eyebrows. In my dream casting, I would have had Jennifer Carpeter from Dexter 10 years ago! I also wanted to announce that I'm going to be printing an art book for CTN-X in November! I hope to see you all there where I will be sharing a table with my Fiance. 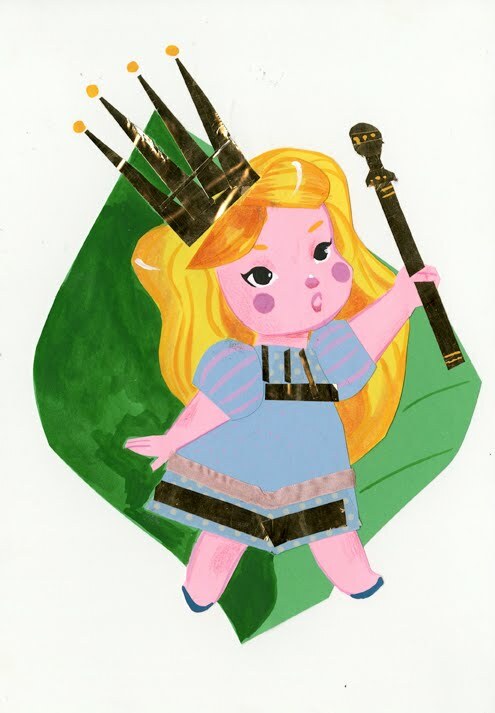 A few weeks ago at Imagineering, they had a Mary Blair show where they displayed many of her original pieces of art! We managed to go on the last week and got to see some of them in real life. I was shocked at the quality of them as well as how much process you could see by seeing the originals. On many of the pieces you could see her grid lines, and how she cut the paper or tape. I loved how you could see that the pieces were both very planned and also very spontaneous. I was also surprised at how much paper cut she used in her pieces many of the scanned images you see in the books don't show the little folds or curls or cut marks. I got really inspired and I wanted to do some pieces integrating paper as well. Here is my first try, using Pricessia Pia again, I also used gold tape and some Washi tape for her dress and crown! I had SO much fun doing it, I can't wait to keep exploring these materials! Anyone who knows me knows that I'm a little bit unfocused! I decided to try this Acrylic style from my Art Director, Mike Giaimo at work! He's an amazing artist and and has taught me alot about handling the materials!